Records have it that the Average American spends up to 70 hours every year attending to their lawn. This is too much time that can be spent on something quite productive I believe – You could master a new hobby, or even relax. Mowing the lawn can be a pretty stressful task. And the time spent on it could be better spent elsewhere. Thanks to technology, many companies have seen the need to spice things up when it comes to mowing the garden – hence the robotic lawn mower. If you are like me who groans every time you remember the lawn needs to be attended to, then it’s high time you consider a robotic lawnmower. All you have got to do is charge the mower, activate the boundaries and program it and allow the mower to do its magic. Thus, while you relax with your favorite coffee, you can watch as the robot lawn mower do all the hard work for you. The beauty of most robot lawn mower is that they don’t have to work on smooth terrain. Many mowers can cope with rough terrains, slopes, obstacles, etc. That is why we thought to bring this review to you. We hope to answer all the questions you might have about the robot lawn mower and ultimately guide you in selecting the best and most suitable one. 1 What is a Robot Lawn Mower? 3 How Does Robot Mower Work? 6 Should I Give The Robotic Lawn Mower a Shot? A robotic lawn mower is an autonomous robot designed to cut lawn grass. In an earlier generation of robotic lawn mowers, users will have to set up border wires around the lawn. This helps to define the area to be mowed. The robot, with this wire, will be able to locate the boundaries to be trimmed. In some cases, the wire can help direct the robot lawn mower to the charging dock. Most robotic lawn mowers are capable of handling roughly 220 000 square feet of grass. Robot lawn mowers, also known as an auto mower are designed to limit human interaction to the barest minimum. These days, auto mowers are getting increasingly sophisticated as they are self-docking and come with rain sensors. The idea behind the robot lawn mower is to limit and reduce all human interaction except when necessary. As a result, you do not have to do lawn mowing again. The technology behind robotic lawn mowers have increased such that they even perform better than human, and they do not need our help. Robomow is one of the top brands in the market known for turning out great automakers. It comes with an installation kit that makes assembly easy. It is durable and friendly in price. It can handle wet grass as well as rough terrains. The Robomow does a unique job of cutting lawns that are not even and handling oddly shaped ones. It can handle a vast expanse of land depending on the brand in a considerably short amount of time. It comes rich designs that enable it to support smartphones app, a rain sensor as well as a child safety lock. Users can be sure that the Robomow lawn mower will not find it challenging to cut grass over high slopes. Thanks to the massive steel blade, it does its work very fast. The blades rotate at a very great speed, hence cutting can never prove tedious. If you are after a mower that can cover a large area of land without much noise, this robotic lawn mower review recommends the Robomow. Honda is a renowned company in the field of robotics. It is a Japanese company that spreads its tentacles to the domestic areas. It has produced some robotic lawn mowers like the Miimo and the HRM series. Honda designs its grass mowers to limit human interaction to the barest minimum. What guides the robot lawn mower is the capacity to perform a task repeatedly. Thus, the Honda robomower will cut the grass in a given period. The cutting system of the Honda robot mower comes with a durable blade that cuts grass into tiny bits. The robot does not come with a cutting collector; hence the grass is dispersed as natural fertilizers. The cutting blade can be adjusted as well. The Honda lawn mower brands can operate in three modes: random, mixed and directional. It comes with a navigation system which consists of perimeter wire stationed at the ground level. On sensing the electrical signal by the robot senses, it changes direction in the perimeter. The Honda robot mower also has sensors that scan the environment all around to detect obstacles. The HusqvarnaAutomower stands out from the average robotic lawn mower. All the brands of this model can cut grasses to smaller bits at a time. These clippings will then fertilize the soil. Asides, one of its unique qualities is the ability to mow in harsh weather while most automatic lawn mowers will return to base. The model can cover a broad expanse of land; the average HusqvarnaAutomower will cover 1.25 acres on a full charge. It is designed with a wide range of sensors that help it navigate extensive areas. It also detects obstacles with the tilt, lift, and other sensors. The HusqvarnaAutomower can handle slopes up to 24 degree and works during the day and night. It comes with a large wheel, giving it the capacity to navigate uneven terrain. It is also quiet in operation. Hence, you do not have to worry about its disturbance. The HusqvarnaAutomower is accompanied with apps that make it easy to monitor and control it remotely. One of the models, the HusqvarnaAutomower 265 ACX comes with an exciting feature that sends text message should there be a disturbance in its operation. It is also accompanied by wires which will help keep the robomower on track. Other exciting features are the theft headlights, GPS navigation, and the front bumper. John Dere is a well-known brand in the agricultural sector. In fact, it stands out as one of the largest producers of agricultural machinery. Thus, it is no surprise that John Dere has found its way onto robotics. It has turned out different brands of robotic lawn mowers, fully autonomous and can work in any weather condition. Tango, e65, etc., are part of the John Dere robotic lawn mower. As with other automatic lawn mowers, it is guided by a boundary wire. John Dere’s robotic lawn mowers are especially suited for terrains with lots of obstacles and can work for land masses up to 1800 sq meters. Designed with a wide range of sensors, John Dere designed its robot mowers to stay away from obstacles with ease. Among the many robot lawn mowers available, John Dere stands out as regards safety. It has a large STOP button for manual emergency shutdown. It can also detect slopes of more than 35 degrees and will stop operation. The John Dere robot lawn mower features a separate pin to prevent theft. It also excels in the area of durability. Asides, John Dere robotic mower, can handle steeper slope, more than other robomowers. It is an excellent choice with a series of programs for lawn maintenance. Worx is another brand name in the field of an automatic lawnmower. It comes in different series like the WorxLandroid, the Worx wg794, etc. The WorxLandroid operates based on an algorithm to negotiate tight space, narrow pathways and even cut the lawns. It is pretty user-friendly and also works with the boundary marker to keep the robot in line. It comes with an onboard computer that helps it navigate hills as well. It has spinning razor blade equipped to cut slice grass into bits – a method preferred compared to traditional mowers. The Worx robot lawn mower also excels in the area of design. It comes with a gold housing which gives it a pleasant look alongside a compact frame. The enormous red button is conspicuous alongside a numeric keypad under the gold casing. There is also the small LCD located on the console. This gives an update on statistics that can help with programming the robomower. The Worx automatic lawn mower can return to the base when it needs charging and also during rainfall. The robotic lawn mower can handle various types of grass like Bermuda, Kentucky bluegrass, and the likes. How Does Robot Mower Work? In other to understand how a robot lawn mower works, an understanding of the different methods is essential. Besides, it should be pointed out that robotic lawn mowers are different. However, they all work based on these three governing principles – there might, however, be slight alterations. This is why the basic idea of how a robot lawn mower works is essential. Due to their similar operating principle, it can be a tedious task to select and pick the best lawn mower for you. 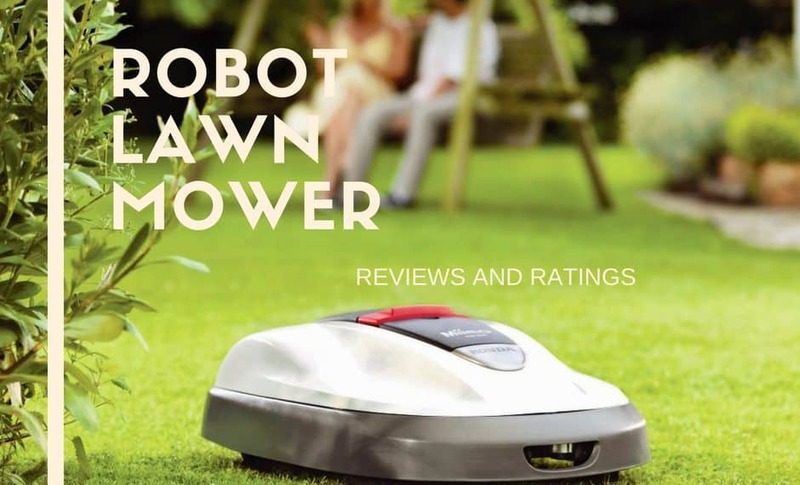 We, however, hope this robot lawn mower review will guide you into doing that. For your robot lawn mower to drive around on itself, a sort of guidance is essential. This is not to say the direction will come from humans. If it does, the whole essence of having a robot lawn mower is defeated already! The purpose of this wire is to serve as an invisible guidance system that sends an electrical signal to the mower. With this, it can map out the entire lawn. Also, with this information supplied, the mower can calculate the route to follow to get the job done. With this, the robot mower can get to work and start cutting. Also, should the robomower run into an obstacle, it has sensors to deal with it. As a result, on sensing an obstacle, the robomower will not continue with the cutting. It will turn off the blade and readjust, then turn around and continue mowing in a different direction. With this, the robotic lawn mower is safe from damage, and whatever obstacle on its way is not spoilt as well. That is just about the navigation system of the robotic lawnmower. It navigates your lawn via the assistance of an invisible guidance system and a fence, employing a programmed route assisted by a sensor to prevent it from running into any obstacle. Like all electrical gadgets, the robomower comes with its charging system. We call it the charging system because it does not work like the conventional charger where you have to plug to a socket. Being a robotic gadget, it has its charging dock. As a result, the robotic lawn mower does more than cutting the lawn all by itself. It can charge itself, eliminating the need to leave it plugged every night before going to bed. In charging the robomower, humans are eliminated from the process as well. Once the mower begins to sense that the power is running out, it will stop and find its way back to the charging dock to recharge. It will automatically lead itself to the exact point where it left off once the battery is full. Asides, owners do not have to worry about the robotic lawn mower missing its way. The station, most time is attached to the perimeter wire which guides the mower. Thus, once your robotic lawn mower starts operation, you do not have to worry as it has got everything figured out. Also known as the manor, the cutting system of the robot lawn mower is pretty unique. This is because it stands out from the way the electric or petrol mowers are designed to cut. While petrol mowers cut off long pieces of grass so users will not have to cut regularly, robomowers use a pretty different approach. Rather than cutting a long piece of grass, robomowers are designed to cut tiny little clips instead. While this could take longer before the user notices any difference, it has a simple and very effective principle. Since the clippings are small, they can get to the bottom of the soil and act as manure. This happens when they decompose and become natural fertilizers and supply nutrients to the soil. In turn, you get a healthy soil which promotes the growth of grass. With this, your lawn looks fresh, green and full! This does not happen with electric mowers. And with time, you notice a considerable improvement in the aesthetic of your lawn. Automatic mowers are fantastic machines and stand way above conventional push mowers. They are so amazing that nothing can compare with their result. Over the years, the markets for robomowers have grown significantly. Besides, experts reveal that it will continue to grow steadily as technology improves. As a result, there will be more innovations with additional features being integrated into each model. This is one of the most crucial elements to consider before buying an automatic lawnmower. Lawns are not created equal as they come in various size, shapes, and terrain. Hence this piece of information is pretty important in selecting a robotic lawnmower. Entry-level models of robotic lawn mowers come with small battery size. This type can only cut small and medium-sized lawns – like 400 square meters. Larger models, on the other hand, can handle large lawns – up to 3000 square meters or more. Without a doubt, robomowers meant for a large expanse need a larger battery as they are required to huge power motors with the large cutting blade. They would also have to be installed with more sophisticated software which would make them pretty expensive compared to entry level! The capacity of the motor usually influences the speed of your robotic mower as well as the area it can cut. Thus, steeper angles require powerful engines. While entry-level robotic mowers could manage slightly steep slopes, people with hilly terrain will need a robotic mower that can handle such a lawn. People with pretty steep lawns should endeavor to calculate the slope of the garden before choosing their robotic lawn mower. All robotic lawn mowers are programmed to stop when they hit an obstacle while working. As explained above, they will reverse, turn around and continue the cutting process away from the obstacle. These are part of the safety features designed in most lawn mowers available in the market today. These prevent injury and damage to humans, pet, animals or properties. There is also the lift and tilt sensor. This is programmed to make the blade stop automatically if they are sufficiently tilted or lifted. As a safety feature as well, the blade of the robot mower is tucked underneath the mower. Hence, to access them, they have to be tilted or lifted. Thus, an inquisitive kid that tries to interrupt the robotic lawn mower while working will not be injured. One of the garden appliances that inflict most injuries on a human is the conventional lawn mowers. The robotic lawn mowers, on the other hand, have not caused significant injuries, despite having sold over a million units. It should, however, be noted that safety features differ between different models. Hence, users should do their research before purchasing any. Most if not all robotic lawn mowers come with a control panel. This control panel allows users to adjust, many variables like the cutting hours and days, the height of the blade, etc. Asides, advanced robotic mowers do come with Wi-Fi and other smart features. With this, the user can monitor as well as control the robot lawn mower from the smartphone. Also, some models do come with weather sensors. With this, they can avoid mowing the garden in wet or rainy condition. Asides, when the lawnmower gets stocked, some model can inform via the smart feature. One would, however, be ready to spend extra on this purchase. When seeking a lawn mower to buy, the security feature is one of the things to consider. Most, if not all robotic lawn mowers come with PIN code locks as well as alarm features. Recent models come with GPS tracker on board. These features are pretty important if your lawn is not secured and can easily be accessed by thieves. There is also the blacklist feature. With it, the manufacturer will blacklist the mower such that it will not be possible to service or repair it in the future. A robot lawn mower will work best in a simply shaped lawn. With a complicated lawn, however, the lawn will be quite difficult for the robot mower to access all areas. Automatic lawn mowers do find narrow sections of lawn pretty tedious to navigate. This is as a result of cutting algorithms employed in determining the direction of the mower. This is why most models of robotic lawn mowers have guide wires as a guiding system to navigate the lawn and ensure all essential areas are cut. The guide wires go through the base station through the middle of the lawn and the furthest area to be cut. This guide is meant to indicate the most distant area to be cut in other words; it ensures all part is touched. Also, when the battery runs down and the robot mower has to return to the charging base, the guidewire will serve as guidance and present the most efficient rule. The same way one install a perimeter is the same way a robotic mower guide wire works. While this increases the installation time, it is an important feature to consider in choosing a robotic lawnmower. While most robotic lawn mowers are suitable to use in all normal weather conditions, manufacturers advise against using it during harsh weather condition. These are torrential rain as well as storms. Asides, it is not a good idea to expose your robotic mower to freezing or freezing condition. Thus, in winter, it is recommended that one bring the lawn mower into the storage. Without a doubt, many other factors also exist that should serve as a buying guide for an automatic lawnmower. We, however, hope this article does provide some guidance as you select the best lawn mower for your garden. Does the Robotic Lawn Mower Detect Obstacles in the Yard (Toys, Rocks, Sprinkle, etc.)? Yes, the robot lawn mower comes with sensors that enable it to detect obstacles in its way. On sensing any obstacles, it will stop work, change direction and cut the cutting operation. Almost all brands of the robotic lawn mowers are equipped with this function. From using the robotic lawn mowers, our experience shows that they will not even go near it. However, should the robomower run into pets, it reverses and continues its operation in another direction? The Honda and the HusqvarnaAutomower are specially equipped with this capacity. Asides, if the robot lawn mower collides with a pet, the impact is light and unlikely to cause any harm. Will the Robot Lawn Mower Cut Grass in Rainy Condition? Ideally, the automatic lawn mower is designed to cut grass in all types of weather conditions. Although, it is recommended that one brings it to base should there be torrential rain or storm. Some brands like the Work automatic lawn mowers can detect rain and return to base during heavy rainfall. Will the Robot Lawn Mower Work in Very Hot Conditions? As long as the temperature is not above 45 degrees, robot lawn mower will work efficiently. High temperature does not affect the working rate and efficiency. The only effect of very high temperature can only be seen in the charging time as they could take longer to charge during extremely high temperatures. How do I Know which Mower to Choose for my Yard Size? This is not a straightforward question. The knowledge of this is fundamental as it can prevent you from wasting money. Thus, you will neither end up buying a small robot lawn mower that will be struggling to keep up nor spend money on a huge robot lawn mower. To help with this, the HusqvarnaAutomower created the Lawn calculator. This can help determine the best automaker suitable for your garden based on your lawn information alongside Google earth imagery. By supplying the necessary information, the calculator will reveal auto mower models that suit your lawn. Does the Robotic Mower Maintain the Lawn? Yes, the robotic lawn mower leaves a fine and even finishes on your lawn. Asides, it is recommended more than the petrol mower due to the way it cuts. Cutting into tiny bits makes the leave drop into the soil and fertilize the ground. This manure gives the lawn a fresh, luxurious finish. Is the Robot Lawn Mower Noisy? No, the noise level of most automatic lawn mower is very minimal. Depending on the model, the noise level ranges from 58 dB(A) to 69 dB(A). This is very minimal compared to the conventional lawn mower with an average of 98 dB(A). Thus, you can have the robot lawn mower work comfortably without disturbing you or your neighbors. Can the Robot Lawn Mower Handle My Uneven lawn? There are many models of automakers available and the degree to which they handle uneven terrains differs. The robot lawn mowers are designed to handle rough terrains. The HusqvarnaAutomower can also cope with rough and uneven terrain very well. Asides small deep hole that can make it get stuck; it handles slopes of up to 24 degrees. The HusqvarnaAutomower can also handle curved lawn effectively. Does the Robotic Lawn Mower Pollute the Environment? All robot lawn mowers run on battery. As a result, it does not generate emission. Hence it is environmentally friendly. Asides, depending on the size of the lawn, users will not have to spend more than 80 dollars of electricity for charging every season. How do I Install the Robot Lawn Mower? The installation of most robot lawn mower is pretty straightforward. Most automatic lawn mower will come with a guide which will help with that. And asides, it should take an average of 3 hours to install depending on the lawn size, complexity and size of the lawn. Does the Robot Lawn Mower have a Theft Alarm? Yes, the robot lawn mower has many theft protections that ensure its safety. Asides, most robotic lawn mowers have to be used with a personal PIN code. The John Dere robot lawn mower and the HusqvarnaAutomowerhave this feature. With the installation lock, the robot mower will not work on any other lawn asides your own. There is also the time lock – a four-digit lock that needs to be entered at the interval. Asides, should the robot mower stop working, one will have to enter the PIN code or else an audio alarm will be activated. All these features make it difficult and pretty useless for a thief to steal the robot lawn mower. Should I Give The Robotic Lawn Mower a Shot? From the above, it is evident that robot lawn mowers are easy to use. It is a worthy investment to ensure you have a clean lawn without much effort on your part. Asides, it translates to you having more time for other things. You should give the robot lawn mower a shot if you do not mind spending just a little more for comfort. In the long run, however, you will realize it is a worthy investment. Asides are setting up; the robotic lawn mower does pretty much everything by itself including charging and staying away from harsh weather conditions. Also, if you care about a healthy lawn, the robotic lawn mower is a good choice. Robot lawn mowers do not hack grass as the petrol lawn mower does. It cuts grass into chips, allowing it to fertilize the soil, providing a green and healthy looking lawn. They are also safe to use, as they are designed to navigate obstacles successfully. Thus, the fear of destroying life, pets or properties is out of the question. All in all, the robotic lawn mower is a worthy investment which will eventually pay for itself in the long run.